Not to be confused with Hyperthyroxinemia. Graves' disease is the cause of about 50% to 80% of the cases of hyperthyroidism in the United States. Other causes include multinodular goiter, toxic adenoma, inflammation of the thyroid, eating too much iodine, and too much synthetic thyroid hormone. A less common cause is a pituitary adenoma. The diagnosis may be suspected based on signs and symptoms and then confirmed with blood tests. Typically blood tests show a low thyroid stimulating hormone (TSH) and raised T3 or T4. Radioiodine uptake by the thyroid, thyroid scan, and TSI antibodies may help determine the cause. Treatment depends partly on the cause and severity of disease. There are three main treatment options: radioiodine therapy, medications, and thyroid surgery. Radioiodine therapy involves taking iodine-131 by mouth which is then concentrated in and destroys the thyroid over weeks to months. The resulting hypothyroidism is treated with synthetic thyroid hormone. Medications such as beta blockers may control the symptoms, and anti-thyroid medications such as methimazole may temporarily help people while other treatments are having effect. Surgery to remove the thyroid is another option. This may be used in those with very large thyroids or when cancer is a concern. In the United States hyperthyroidism affects about 1.2% of the population. It occurs between two and ten times more often in women. Onset is commonly between 20 and 50 years of age. Overall the disease is more common in those over the age of 60 years. Thyroid hormone is critical to normal function of cells. In excess, it both overstimulates metabolism and exacerbates the effect of the sympathetic nervous system, causing "speeding up" of various body systems and symptoms resembling an overdose of epinephrine (adrenaline). These include fast heart beat and symptoms of palpitations, nervous system tremor such as of the hands and anxiety symptoms, digestive system hypermotility, unintended weight loss, and (in "lipid panel" blood tests) a lower and sometimes unusually low serum cholesterol. Major clinical signs include weight loss (often accompanied by an increased appetite), anxiety, heat intolerance, hair loss (especially of the outer third of the eyebrows), muscle aches, weakness, fatigue, hyperactivity, irritability, high blood sugar, excessive urination, excessive thirst, delirium, tremor, pretibial myxedema (in Graves' disease), emotional lability, and sweating. Panic attacks, inability to concentrate, and memory problems may also occur. Psychosis and paranoia, common during thyroid storm, are rare with milder hyperthyroidism. Many persons will experience complete remission of symptoms 1 to 2 months after a euthyroid state is obtained, with a marked reduction in anxiety, sense of exhaustion, irritability, and depression. Some individuals may have an increased rate of anxiety or persistence of affective and cognitive symptoms for several months to up to 10 years after a euthyroid state is established. In addition, those with hyperthyroidism may present with a variety of physical symptoms such as palpitations and abnormal heart rhythms (the notable ones being atrial fibrillation), shortness of breath (dyspnea), loss of libido, amenorrhea, nausea, vomiting, diarrhea, gynecomastia and feminization. Long term untreated hyperthyroidism can lead to osteoporosis. These classical symptoms may not be present often in the elderly. Minor ocular (eye) signs, which may be present in any type of hyperthyroidism, are eyelid retraction ("stare"), extraocular muscle weakness, and lid-lag. In hyperthyroid stare (Dalrymple sign) the eyelids are retracted upward more than normal (the normal position is at the superior corneoscleral limbus, where the "white" of the eye begins at the upper border of the iris). Extraocular muscle weakness may present with double vision. In lid-lag (von Graefe's sign), when the patient tracks an object downward with their eyes, the eyelid fails to follow the downward moving iris, and the same type of upper globe exposure which is seen with lid retraction occurs, temporarily. These signs disappear with treatment of the hyperthyroidism. Thyroid storm is a severe form of thyrotoxicosis characterized by rapid and often irregular heart beat, high temperature, vomiting, diarrhea, and mental agitation. Symptoms may be unusual in the young, old, or pregnant. It is a medical emergency and requires hospital care to control the symptoms rapidly. Even with treatment, death occurs in 20% to 50%. Hyperthyroidism due to certain types of thyroiditis can eventually lead to hypothyroidism (a lack of thyroid hormone), as the thyroid gland is damaged. Also, radioiodine treatment of Graves' disease often eventually leads to hypothyroidism. Such hypothyroidism may be treated by regular thyroid hormone testing and oral thyroid hormone supplementation. There are several causes of hyperthyroidism. Most often, the entire gland is overproducing thyroid hormone. Less commonly, a single nodule is responsible for the excess hormone secretion, called a "hot" nodule. Thyroiditis (inflammation of the thyroid) can also cause hyperthyroidism. Functional thyroid tissue producing an excess of thyroid hormone occurs in a number of clinical conditions. Graves' disease. An autoimmune disease (usually, the most common etiology with 50-80% worldwide, although this varies substantially with location- i.e., 47% in Switzerland (Horst et al., 1987) to 90% in the USA (Hamburger et al. 1981)). Thought to be due to varying levels of iodine in the diet. It is eight times more common in females than males and often occurs in young females, around 20 – 40 years of age. Inflammation of the thyroid is called thyroiditis. There are several different kinds of thyroiditis including Hashimoto's thyroiditis (Hypothyroidism immune-mediated), and subacute thyroiditis (de Quervain's). These may be initially associated with secretion of excess thyroid hormone but usually progress to gland dysfunction and, thus, to hormone deficiency and hypothyroidism. Oral consumption of excess thyroid hormone tablets is possible (surreptitious use of thyroid hormone), as is the rare event of consumption of ground beef contaminated with thyroid tissue, and thus thyroid hormone (termed "hamburger hyperthyroidism"). Pharmacy compounding errors may also be a cause. Amiodarone, an antiarrhythmic drug, is structurally similar to thyroxine and may cause either under- or overactivity of the thyroid. Postpartum thyroiditis (PPT) occurs in about 7% of women during the year after they give birth. PPT typically has several phases, the first of which is hyperthyroidism. This form of hyperthyroidism usually corrects itself within weeks or months without the need for treatment. A struma ovarii is a rare form of monodermal teratoma that contains mostly thyroid tissue, which leads to hyperthyroidism. Excess iodine consumption notably from algae such as kelp. Thyrotoxicosis can also occur after taking too much thyroid hormone in the form of supplements, such as levothyroxine (a phenomenon known as exogenous thyrotoxicosis, alimentary thyrotoxicosis, or occult factitial thyrotoxicosis). Hypersecretion of thyroid stimulating hormone (TSH), which in turn is almost always caused by a pituitary adenoma, accounts for much less than 1 percent of hyperthyroidism cases. Measuring specific antibodies, such as anti-TSH-receptor antibodies in Graves' disease, or anti-thyroid peroxidase in Hashimoto's thyroiditis — a common cause of hypothyroidism — may also contribute to the diagnosis. Thyroid scintigraphy is a useful test to characterize (distinguish between causes of) hyperthyroidism, and this entity from thyroiditis. This test procedure typically involves two tests performed in connection with each other: an iodine uptake test and a scan (imaging) with a gamma camera. The uptake test involves administering a dose of radioactive iodine (radioiodine), traditionally iodine-131 (131I), and more recently iodine-123 (123I). Iodine-123 may be the preferred radionuclide in some clinics due to its more favorable radiation dosimetry (i.e. less radiation dose to the patient per unit administered radioactivity) and a gamma photon energy more amenable to imaging with the gamma camera. For the imaging scan, I-123 is considered an almost ideal isotope of iodine for imaging thyroid tissue and thyroid cancer metastasis. Typical administration involves a pill or liquid containing sodium iodide (NaI) taken orally, which contains a small amount of iodine-131, amounting to perhaps less than a grain of salt. A 2-hour fast of no food prior to and for 1 hour after ingesting the pill is required. This low dose of radioiodine is typically tolerated by individuals otherwise allergic to iodine (such as those unable to tolerate contrast mediums containing larger doses of iodine such as used in CT scan, intravenous pyelogram (IVP), and similar imaging diagnostic procedures). Excess radioiodine that does not get absorbed into the thyroid gland is eliminated by the body in urine. Some patients may experience a slight allergic reaction to the diagnostic radioiodine and may be given an antihistamine. In hyperthyroidism CK-MB (Creatine kinase) is usually elevated. In overt primary hyperthyroidism, TSH levels are low and T4 and T3 levels are high. Subclinical hyperthyroidism is a milder form of hyperthyroidism characterized by low or undetectable serum TSH level, but with a normal serum free thyroxine level. Although the evidence for doing so is not definitive, treatment of elderly persons having subclinical hyperthyroidism could reduce the incidence of atrial fibrillation. There is also an increased risk of bone fractures (by 42%) in people with subclinical hyperthyroidism; there is insufficient evidence to say whether treatment with antithyroid medications would reduce that risk. In those without symptoms who are not pregnant there is little evidence for or against screening. Thyrostatics (antithyroid drugs) are drugs that inhibit the production of thyroid hormones, such as carbimazole (used in the UK) and methimazole (used in the US, Germany and Russia), and propylthiouracil. Thyrostatics are believed to work by inhibiting the iodination of thyroglobulin by thyroperoxidase and, thus, the formation of tetraiodothyronine (T4). Propylthiouracil also works outside the thyroid gland, preventing the conversion of (mostly inactive) T4 to the active form T3. Because thyroid tissue usually contains a substantial reserve of thyroid hormone, thyrostatics can take weeks to become effective and the dose often needs to be carefully titrated over a period of months, with regular doctor visits and blood tests to monitor results. A very high dose is often needed early in treatment, but, if too high a dose is used persistently, patients can develop symptoms of hypothyroidism. This titrating of the dose is difficult to do accurately, and so sometimes a "block and replace" attitude is taken. In block and replace treatments thyrostatics are taken in sufficient quantities to completely block thyroid hormones, and the patient treated as though they have complete hypothyroidism. Many of the common symptoms of hyperthyroidism such as palpitations, trembling, and anxiety are mediated by increases in beta-adrenergic receptors on cell surfaces. Beta blockers, typically used to treat high blood pressure, are a class of drugs that offset this effect, reducing rapid pulse associated with the sensation of palpitations, and decreasing tremor and anxiety. Thus, a patient suffering from hyperthyroidism can often obtain immediate temporary relief until the hyperthyroidism can be characterized with the Radioiodine test noted above and more permanent treatment take place. Note that these drugs do not treat hyperthyroidism or any of its long-term effects if left untreated, but, rather, they treat or reduce only symptoms of the condition. Some minimal effect on thyroid hormone production however also comes with Propranolol - which has two roles in the treatment of hyperthyroidism, determined by the different isomers of propranolol. L-propranolol causes beta-blockade, thus treating the symptoms associated with hyperthyroidism such as tremor, palpitations, anxiety, and heat intolerance. D-propranolol inhibits thyroxine deiodinase, thereby blocking the conversion of T4 to T3, providing some though minimal therapeutic effect. Other beta-blockers are used to treat only the symptoms associated with hyperthyroidism. Propranolol in the UK, and metoprolol in the US, are most frequently used to augment treatment for hyperthyroid patients. People with autoimmune hyperthyroidism (such as in Grave's disease) should not eat foods high in iodine, such as edible seaweed and kelps. From a public health perspective, the general introduction of iodized salt in the United States in 1924 resulted in lower disease, goiters, as well as improving the lives of children whose mothers would not have eaten enough iodine during pregnancy which would have lowered the IQs of their children. 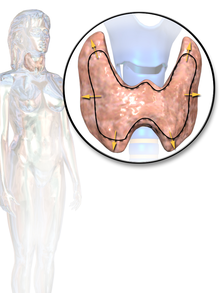 Surgery (thyroidectomy to remove the whole thyroid or a part of it) is not extensively used because most common forms of hyperthyroidism are quite effectively treated by the radioactive iodine method, and because there is a risk of also removing the parathyroid glands, and of cutting the recurrent laryngeal nerve, making swallowing difficult, and even simply generalized staphylococcal infection as with any major surgery. Some people with Graves' may opt for surgical intervention. This includes those that cannot tolerate medicines for one reason or another, people that are allergic to iodine, or people that refuse radioiodine. If people have toxic nodules treatments typically include either removal or injection of the nodule with alcohol. In iodine-131 (radioiodine) radioisotope therapy, which was first pioneered by Dr. Saul Hertz, radioactive iodine-131 is given orally (either by pill or liquid) on a one-time basis, to severely restrict, or altogether destroy the function of a hyperactive thyroid gland. This isotope of radioactive iodine used for ablative treatment is more potent than diagnostic radioiodine (usually iodine-123 or a very low amount of iodine-131), which has a biological half-life from 8–13 hours. Iodine-131, which also emits beta particles that are far more damaging to tissues at short range, has a half-life of approximately 8 days. Patients not responding sufficiently to the first dose are sometimes given an additional radioiodine treatment, at a larger dose. Iodine-131 in this treatment is picked up by the active cells in the thyroid and destroys them, rendering the thyroid gland mostly or completely inactive. Since iodine is picked up more readily (though not exclusively) by thyroid cells, and (more important) is picked up even more readily by over-active thyroid cells, the destruction is local, and there are no widespread side effects with this therapy. Radioiodine ablation has been used for over 50 years, and the only major reasons for not using it are pregnancy and breastfeeding (breast tissue also picks up and concentrates iodine). Once the thyroid function is reduced, replacement hormone therapy (levothyroxine) taken orally each day may easily provide the required amount of thyroid hormone the body needs. There is extensive experience, over many years, of the use of radioiodine in the treatment of thyroid overactivity and this experience does not indicate any increased risk of thyroid cancer following treatment. However, a study from 2007 has reported an increased cancer incidence after radioiodine treatment for hyperthyroidism. The principal advantage of radioiodine treatment for hyperthyroidism is that it tends to have a much higher success rate than medications. Depending on the dose of radioiodine chosen, and the disease under treatment (Graves' vs. toxic goiter, vs. hot nodule etc. ), the success rate in achieving definitive resolution of the hyperthyroidism may vary from 75-100%. A major expected side-effect of radioiodine in patients with Graves' disease is the development of lifelong hypothyroidism, requiring daily treatment with thyroid hormone. On occasion, some patients may require more than one radioactive treatment, depending on the type of disease present, the size of the thyroid, and the initial dose administered. Graves' disease patients manifesting moderate or severe Graves' ophthalmopathy are cautioned against radioactive iodine-131 treatment, since it has been shown to exacerbate existing thyroid eye disease. Patients with mild or no ophthalmic symptoms can mitigate their risk with a concurrent six-week course of prednisone. The mechanisms proposed for this side effect involve a TSH receptor common to both thyrocytes and retro-orbital tissue. As radioactive iodine treatment results in the destruction of thyroid tissue, there is often a transient period of several days to weeks when the symptoms of hyperthyroidism may actually worsen following radioactive iodine therapy. In general, this happens as a result of thyroid hormones being released into the blood following the radioactive iodine-mediated destruction of thyroid cells that contain thyroid hormone. In some patients, treatment with medications such as beta blockers (propranolol, atenolol, etc.) may be useful during this period of time. Most patients do not experience any difficulty after the radioactive iodine treatment, usually given as a small pill. On occasion, neck tenderness or a sore throat may become apparent after a few days, if moderate inflammation in the thyroid develops and produces discomfort in the neck or throat area. This is usually transient, and not associated with a fever, etc. Women breastfeeding should discontinue breastfeeding for at least a week, and likely longer, following radioactive iodine treatment, as small amounts of radioactive iodine may be found in breast milk even several weeks after the radioactive iodine treatment. A common outcome following radioiodine is a swing from hyperthyroidism to the easily treatable hypothyroidism, which occurs in 78% of those treated for Graves' thyrotoxicosis and in 40% of those with toxic multinodular goiter or solitary toxic adenoma. Use of higher doses of radioiodine reduces the incidence of treatment failure, with penalty for higher response to treatment consisting mostly of higher rates of eventual hypothyroidism which requires hormone treatment for life. There is increased sensitivity to radioiodine therapy in thyroids appearing on ultrasound scans as more uniform (hypoechogenic), due to densely packed large cells, with 81% later becoming hypothyroid, compared to just 37% in those with more normal scan appearances (normoechogenic). Thyroid storm presents with extreme symptoms of hyperthyroidism. It is treated aggressively with resuscitation measures along with a combination of the above modalities including: an intravenous beta blockers such as propranolol, followed by a thioamide such as methimazole, an iodinated radiocontrast agent or an iodine solution if the radiocontrast agent is not available, and an intravenous steroid such as hydrocortisone. In the United States hyperthyroidism affects about 1.2% of the population. About half of these cases have obvious symptoms while the other half do not. It occurs between two and ten times more often in women. The disease is more common in those over the age of 60 years. Subclinical hyperthyroidism modestly increases the risk of cognitive impairment and dementia. Caleb Hillier Parry first made the association between the goiter and protrusion of the eyes in 1786, however, did not publish his findings until 1825. In 1835, Irish doctor Robert James Graves discovered a link between the protrusion of the eyes and goiter, giving his name to the autoimmune disease now known as Graves' Disease. Recognizing and evaluating hyperthyroidism in pregnancy is a diagnostic challenge. Thyroid hormones are naturally elevated during pregnancy and hyperthyroidism must also be distinguished from gestational transient thyrotoxicosis. Nonetheless, high maternal FT4 levels during pregnancy have been associated with impaired brain developmental outcomes of the offspring and this was independent of for example hCG levels. Hyperthyroidism is one of the most common endocrine conditions affecting older domesticated housecats. Some veterinarians estimate that it occurs in up to 2% of cats over the age of 10. The disease has become significantly more common since the first reports of feline hyperthyroidism in the 1970s. One cause of hyperthyroidism in cats is the presence of benign tumors, but the reason these cats develop such tumors continues to be studied. However, recent research published in Environmental Science & Technology, a publication of the American Chemical Society, suggests that many cases of feline hyperthyroidism are associated with exposure to environmental contaminants called polybrominated diphenyl ethers (PBDEs), which are present in flame retardants in many household products, in particular, furniture and some electronics. The study on which the report was based was conducted jointly by researchers at the EPA's National Health and Environmental Effects Laboratory and Indiana University. In the study, which involved 23 pet cats with feline hyperthyroidism, PBDE blood levels were three times as high as those in younger, non-hyperthyroid cats. In ideal circumstances, PBDE and related endocrine disruptors that seriously damage health would not be present in the blood of any animals, including humans. Several studies indicate canned fish, liver and giblet prepared cat food may increase risk whereas fertilizers, herbicides, or plant pesticides had no effect. Another study suggests cat litter could be a problem. Mutations of the thyroid-stimulating hormone receptor that cause a constitutive activation of the thyroid gland cells have been discovered recently. Many other factors may play a role in the pathogenesis of the disease such as goitrogens (isoflavones such as genistein, daidzein, and quercetin) as well as the iodine and selenium content of the cat's diet. The most common presenting symptoms are: rapid weight loss, tachycardia (rapid heart rate), vomiting, diarrhea, increased consumption of fluids (polydipsia) and food, and increased urine production (polyuria). Other symptoms include hyperactivity, possible aggression, an unkempt appearance, and large, thick claws. Heart murmurs and a gallop rhythm can develop due to secondary hypertrophic cardiomyopathy. About 70% of afflicted cats also have enlarged thyroid glands (goiter). The same three treatments used with humans are also options in treating feline hyperthyroidism (surgery, radioiodine treatment, and anti-thyroid drugs). There is also a special low iodine diet available that will control the symptoms providing no other food is fed. The drugs used to help manage the symptoms of hyperthyroidism are methimazole and carbimazole. Where drug therapy is used it must be given to cats for the remainder of their lives but this may be the least expensive option, especially for very old cats. Carbimazole is only available as a once daily tablet. Methimazole is available as an oral solution, a tablet and as a topical gel, that is applied using a finger cot to the hairless skin inside a cat's ear. Many cat owners find this gel a good option for cats that don't like being given pills. Radioiodine treatment and surgery often cure hyperthyroidism but some veterinarians prefer radioiodine treatment over surgery because it doesn't carry the risks associated with anesthesia. Radioiodine treatment, however, is not available in all areas for cats as this treatment requires nuclear radiological expertise and facilities as the cat's urine, sweat, saliva, and stool are radioactive for several days after the treatment requiring special inpatient handling and facilities usually for a total of 3 weeks (first week in total isolation and the next two weeks in close confinement). In the United States, the guidelines for radiation levels vary from state to state; some states such as Massachusetts allow hospitalization for as little as two days before the animal is sent home with care instructions. Surgery can remove one or both of the thyroid glands. If only one of the thyroid glands is removed, in the majority of cats, the remaining gland will become overactive after a period of time. If both glands are removed at once, there is a risk of affecting calcium metabolism as the parathyroid glands are closely associated with the thyroid glands. Most cats recover parathyroid function, but require several months of calcium and Vitamin D supplementation first. In some cats, the overactive tissue is found in the thoracic cavity (the chest). Surgery is not considered an option for these cats. Hypothyroidism is rarely a side effect of surgery in cats, but may be seen after radioactive iodine treatment. It usually resolves within 6 months, however. Hyperthyroidism is much less common in dogs compared to cats. Hyperthyroidism may be caused by a thyroid tumor. This may be a thyroid carcinoma. About 90% of carcinomas are a very aggressive; they invade the surrounding tissues and metastasize (spread), to other tissues, particularly the lungs. This has a poor prognosis. Surgery to remove the tumor a carcinoma is often very difficult, due to the spread of the tumor to the surrounding tissue, for example, into arteries, the esophagus, or the windpipe. It may be possible to reduce the size of the tumor, thus relieving symptoms and allowing time for other treatments to work. About 10% of thyroid tumors are benign; these often cause few symptoms. In dogs treated for hypothyroidism (lack of thyroid hormone), hyperthyroidism may occur as a result of an overdose of the thyroid hormone replacement medication, levothyroxine; in this case treatment involves reducing the dose of levothyroxine. Dogs which display coprophagy, that is, which often eat feces, and which live in a household with a dog receiving levothyroxine treatment, may develop hyperthryoidism if they frequently eat the feces from the dog receiving levothyroxine treatment. Hyperthyroidism may occur if a dog eats an excessive amount of thyroid gland tissue. This has occurred in dogs fed commercial dog food. ^ a b c d e f g h i j k l m n o p q r s t u v w x y "Hyperthyroidism". www.niddk.nih.gov. July 2012. Archived from the original on 4 April 2015. Retrieved 2 April 2015. ^ a b c d e f g h i j Devereaux, D.; Tewelde, SZ. (May 2014). "Hyperthyroidism and thyrotoxicosis". Emerg Med Clin North Am. 32 (2): 277–92. doi:10.1016/j.emc.2013.12.001. PMID 24766932. ^ a b c d e Bahn Chair, RS; Burch, HB; Cooper, DS; Garber, JR; Greenlee, MC; Klein, I; Laurberg, P; McDougall, IR; Montori, VM; Rivkees, SA; Ross, DS; Sosa, JA; Stan, MN (June 2011). "Hyperthyroidism and other causes of thyrotoxicosis: management guidelines of the American Thyroid Association and American Association of Clinical Endocrinologists". Thyroid. 21 (6): 593–646. doi:10.1089/thy.2010.0417. PMID 21510801. ^ Erik D Schraga (30 May 2014). "Hyperthyroidism, Thyroid Storm, and Graves Disease". Archived from the original on 5 April 2015. Retrieved 20 April 2015. ^ NIDDK (13 March 2013). "Hypothyroidism". Archived from the original on 5 March 2016. Retrieved 20 April 2015. ^ Brent, Gregory A. (Jun 12, 2008). "Clinical practice. Graves' disease". The New England Journal of Medicine. 358 (24): 2594–2605. doi:10.1056/NEJMcp0801880. ISSN 1533-4406. PMID 18550875. ^ "Depression and Psychosis in Neurological Practice.". Bradley's neurology in clinical practice (6th ed.). Philadelphia, PA: Elsevier/Saunders. 2012. pp. 102–103. ISBN 978-1437704341. ^ Chan WB, Yeung VT, Chow CC, So WY, Cockram CS (1999). "Gynaecomastia as a presenting feature of thyrotoxicosis". Postgrad Med J. 75 (882): 229–31. doi:10.1136/pgmj.75.882.229. PMC 1741202. PMID 10715765. ^ Faculty of Medicine & Dentistry (2006). "Course-Based Physical Examination - Endocrinology -- Endocrinology Objectives (Thyroid Exam)". Undergraduate Medical Education. University of Alberta. Archived from the original on 19 January 2008. Retrieved 28 January 2007. ^ "Hyperthyroidism Overview". Archived from the original on 28 April 2010. Retrieved 27 April 2010. ^ a b Andersson, Maria; Zimmermann, Michael B. (2010). "Influence of Iodine Deficiency and Excess on Thyroid Function Tests". Endocrine Updates. 28: 45–69. doi:10.1007/978-1-4419-1485-9_3. ISBN 978-1-4419-1484-2. ISSN 1566-0729. ^ Bains, Ajay, Ami-Joseph Brosseau, and David Harrison. “Iatrogenic Thyrotoxicosis Secondary to Compounded Liothyronine.” The Canadian Journal of Hospital Pharmacy 68.1 (2015): 57–59. Print. ^ "Floyd, J.L. (2009) Thyrotoxicosis. eMedicine". 21 March 2017. Archived from the original on 17 March 2010. ^ Park, Hee-Myung (1 January 2002). "123I: Almost a Designer Radioiodine for Thyroid Scanning". Journal of Nuclear Medicine. 43 (1): 77–78. Archived from the original on 12 October 2008. Retrieved 10 May 2010. ^ Biondi B1, Cooper DS (2008). "The clinical significance of subclinical thyroid dysfunction". Endocrine Reviews. 29 (1): 76–131. doi:10.1210/er.2006-0043. PMID 17991805. ^ Surks MI, Ortiz E, Daniels GH, Sawin CT, Col NF, Cobin RH, Franklyn JA, Hershman JM, Burman KD, Denke MA, Gorman C, Cooper RS, Weissman NJ (2004). "Subclinical thyroid disease: scientific review and guidelines for diagnosis and management" (PDF). JAMA. 291 (2): 228–238. doi:10.1001/jama.291.2.228. PMID 14722150. ^ Blum, Manuel R.; Bauer, Douglas C.; Collet, Tinh-Hai; Fink, Howard A.; Cappola, Anne R.; da Costa, Bruno R.; Wirth, Christina D.; Peeters, Robin P.; Åsvold, Bjørn O.; den Elzen, Wendy P. J.; Luben, Robert N.; Imaizumi, Misa; Bremner, Alexandra P.; Gogakos, Apostolos; Eastell, Richard; Kearney, Patricia M.; Strotmeyer, Elsa S.; Wallace, Erin R.; Hoff, Mari; Ceresini, Graziano; Rivadeneira, Fernando; Uitterlinden, André G.; Stott, David J.; Westendorp, Rudi G. J.; Khaw, Kay-Tee; Langhammer, Arnuf; Ferrucci, Luigi; Gussekloo, Jacobijn; Williams, Graham R.; Walsh, John P.; Jüni, Peter; Aujesky, Drahomir; Rodondi, Nicolas (26 May 2015). "Subclinical Thyroid Dysfunction and Fracture Risk". JAMA. 313 (20): 2055–65. doi:10.1001/jama.2015.5161. PMC 4729304. PMID 26010634. ^ LeFevre, ML; U.S. Preventive Services Task, Force (5 May 2015). "Screening for thyroid dysfunction: U.S. Preventive Services Task Force recommendation statement". Annals of Internal Medicine. 162 (9): 641–50. doi:10.7326/m15-0483. PMID 25798805. ^ Fumarola, A; Di Fiore, A; Dainelli, M; Grani, G; Calvanese, A (Nov 2010). "Medical treatment of hyperthyroidism: state of the art". Experimental and Clinical Endocrinology & Diabetes. 118 (10): 678–84. doi:10.1055/s-0030-1253420. PMID 20496313. ^ Eber O, Buchinger W, Lindner W, et al. (1990). "The effect of D-versus L-propranolol in the treatment of hyperthyroidism". Clin Endocrinol. 32 (3): 363–72. doi:10.1111/j.1365-2265.1990.tb00877.x. ^ Geffner DL, Hershman JM (July 1992). "β-Adrenergic blockade for the treatment of hyperthyroidism". The American Journal of Medicine. 93 (1): 61–8. doi:10.1016/0002-9343(92)90681-Z. PMID 1352658. ^ Max Nisen (22 July 2013). "How Adding Iodine To Salt Resulted In A Decade's Worth Of IQ Gains For The United States". Business Insider. Archived from the original on 23 July 2013. Retrieved 23 July 2013. ^ Catania, A; Guaitoli, E; Carbotta, G; Bianchini, M; Di Matteo, FM; Carbotta, S; Nardi, M; Fabiani, E; Grani, G; D'Andrea, V; Fumarola, A (2012). "Total thyroidectomy for Graves' disease treatment". La Clinica Terapeutica. 164 (3): 193–6. doi:10.7417/CT.2013.1548. PMID 23868618. ^ al. ], senior editors, J. Larry Jameson, Leslie J. De Groot; section editors, David de Kretser ... [et (2010). Endocrinology : adult and pediatric (6th ed.). Philadelphia: Saunders/Elsevier. p. Chapter 82. ISBN 9781416055839. ^ Hertz, Barbara, Schuleller, Kristin, Saul Hertz, MD (1905 - 1950) A Pioneer in the Use of Radioactive Iodine, Endocrine Practice 2010 16,4;713-715. ^ a b Metso, S; Auvinen, A; Huhtala, H; Salmi, J; Oksala, H; Jaatinen, P (2007). "Increased cancer incidence after radioiodine treatment for hyperthyroidism". Cancer. 109 (10): 1972–9. doi:10.1002/cncr.22635. PMID 17393376. ^ Walsh JP, Dayan CM, Potts MJ (1999). "Radioiodine and thyroid eye disease". BMJ. 319 (7202): 68–9. doi:10.1136/bmj.319.7202.68. PMC 1116221. PMID 10398607. ^ Berglund J, Christensen SB, Dymling JF, Hallengren B (May 1991). "The incidence of recurrence and hypothyroidism following treatment with antithyroid drugs, surgery or radioiodine in all patients with thyrotoxicosis in Malmö during the period 1970-1974". Journal of Internal Medicine. 229 (5): 435–42. doi:10.1111/j.1365-2796.1991.tb00371.x. PMID 1710255. ^ Esfahani AF; Kakhki VR; Fallahi B; et al. (2005). "Comparative evaluation of two fixed doses of 185 and 370 MBq 131I, for the treatment of Graves' disease resistant to antithyroid drugs". Hellenic Journal of Nuclear Medicine. 8 (3): 158–61. PMID 16390021. ^ Markovic V, Eterovic D (September 2007). "Thyroid echogenicity predicts outcome of radioiodine therapy in patients with Graves' disease". The Journal of Clinical Endocrinology and Metabolism. 92 (9): 3547–52. doi:10.1210/jc.2007-0879. PMID 17609305. ^ Tintinalli, Judith (2004). Emergency Medicine: A Comprehensive Study Guide, Sixth edition. McGraw-Hill Professional. p. 1312. ISBN 978-0-07-138875-7. ^ Rieben, Carole; Segna, Daniel; da Costa, Bruno R.; Collet, Tinh-Hai; Chaker, Layal; Aubert, Carole E.; Baumgartner, Christine; Almeida, Osvaldo P.; Hogervorst, Eef; Trompet, Stella; Masaki, Kamal; Mooijaart, Simon P.; Gussekloo, Jacobijn; Peeters, Robin P.; Bauer, Douglas C.; Aujesky, Drahomir; Rodondi, Nicolas (30 September 2016). "Subclinical Thyroid Dysfunction and the Risk of Cognitive Decline: a Meta-Analysis of Prospective Cohort Studies". The Journal of Clinical Endocrinology & Metabolism. 101 (12): jc.2016–2129. doi:10.1210/jc.2016-2129. PMC 6287525. PMID 27689250. ^ An Appraisal of Endocrinology: A Report Made to the Directors of the John and Mary R. Markle Foundation by a Special Committee of the National Research Council Consisting of Walter B. Cannon, Chairman, Earl Engle, Curt Richter, Oscar Riddle, R.G. Hoskins ... with the Assistance of Milton Lee. National Academies. 1936. p. 9. Archived from the original on 8 September 2017. ^ Fumarola, A; Di Fiore, A; Dainelli, M; Grani, G; Carbotta, G; Calvanese, A (June 2011). "Therapy of hyperthyroidism in pregnancy and breastfeeding". Obstetrical & Gynecological Survey. 66 (6): 378–85. doi:10.1097/ogx.0b013e31822c6388. PMID 21851752. ^ Korevaar, Tim I M; Muetzel, Ryan; Medici, Marco; Chaker, Layal; Jaddoe, Vincent W V; De Rijke, Yolanda B; Steegers, Eric A P; Visser, Theo J; White, Tonya; Tiemeier, Henning; Peeters, Robin P (2016). "Association of maternal thyroid function during early pregnancy with offspring IQ and brain morphology in childhood: A population-based prospective cohort study". The Lancet Diabetes & Endocrinology. 4 (1): 35–43. doi:10.1016/S2213-8587(15)00327-7. PMID 26497402. ^ Mizukawa, Hazuki; Nomiyama, Kei; Nakatsu, Susumu; Iwata, Hisato; Yoo, Jean; Kubota, Akira; Yamamoto, Miyuki; Ishizuka, Mayumi; Ikenaka, Yoshinori (2016-01-05). "Organohalogen Compounds in Pet Dog and Cat: Do Pets Biotransform Natural Brominated Products in Food to Harmful Hydroxlated Substances?". Environmental Science & Technology. 50 (1): 444–452. doi:10.1021/acs.est.5b04216. ISSN 1520-5851. PMID 26630569. ^ Dye, Janice A.; Venier, Marta; Zhu, Lingyan; Ward, Cynthia R.; Hites, Ronald A.; Birnbaum, Linda S. (2007-09-15). "Elevated PBDE levels in pet cats: sentinels for humans?". Environmental Science & Technology. 41 (18): 6350–6356. doi:10.1021/es0708159. ISSN 0013-936X. PMID 17948778. ^ Esfahani AF; Martin KM1; Rossing MA; DiGiacomo RF; Freitag WA (2000). "Evaluation of dietary and environmental risk factors for hyperthyroidism in cats". J Am Vet Med Assoc. 217 (6): 853–6. doi:10.2460/javma.2000.217.853. PMID 10997155. ^ Kass PH1; Peterson ME; Levy J; James K; Freitag WA; Becker DV; Cowgill LD (1999). "Evaluation of environmental, nutritional, and host factors in cats with hyperthyroidism". J Vet Intern Med. 13 (4): 323–9. doi:10.1892/0891-6640(1999)013<0323:eoenah>2.3.co;2. PMID 10449223. ^ Little, Susan (2006). "Feline Hyperthyroidism" (PDF). Winn Feline Foundation. Archived from the original (PDF) on 9 May 2009. Retrieved 24 June 2009. ^ Ford, Richard B.; Mazzaferro, Elisa (2011). Kirk & Bistner's Handbook of Veterinary Procedures and Emergency Treatment (9th ed.). London: Elsevier Health Sciences. p. 346. ISBN 9781437707991. ^ "Hypothyroidism". Merck Veterinary Manual. Archived from the original on 26 May 2011. Retrieved 27 July 2011. ^ "Leventa-Precautions/Adverse Reactions". Intervet. Archived from the original on 14 January 2012. Retrieved 27 July 2011. ^ Shadwick, SR; Ridgway, MD; Kubier, A (October 2013). "Thyrotoxicosis in a dog induced by the consumption of feces from a levothyroxine-supplemented housemate". The Canadian Veterinary Journal. 54 (10): 987–9. PMC 3781434. PMID 24155422. ^ Broome, MR; Peterson, ME; Kemppainen, RJ; Parker, VJ; Richter, KP (1 January 2015). "Exogenous thyrotoxicosis in dogs attributable to consumption of all-meat commercial dog food or treats containing excessive thyroid hormone: 14 cases (2008-2013)". Journal of the American Veterinary Medical Association. 246 (1): 105–11. doi:10.2460/javma.246.1.105. PMID 25517332. Gina Spadafori (20 January 1997). "Hyperthyroidism: A Common Ailment in Older Cats". The Pet Connection. Veterinary Information Network. Retrieved 28 January 2007. Siraj, Elias S. (June 2008). "Update on the Diagnosis and Treatment of Hyperthyroidism" (PDF). Journal of Clinical Outcomes Management. 15 (6): 298–307. Retrieved 24 June 2009.